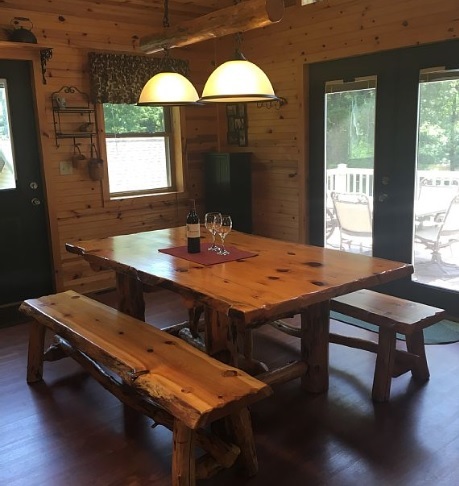 This unique home utilizes an efficient layout that maximizes the use of a small living space while offering a warm rustic feel with knotty pine walls and custom pine cabinetry. The open floor plan in the front half of the house stylishly combines the kitchen, dining and family room with a vaulted ceiling and skylights. The well equipped kitchen and eating area features custom cabinets with a work island and spacious table. You'll find an abundance of dinnerware, cookware and small appliances to complement the full size appliances. In the family room you’ll enjoy a 42" flat screen TV with DISH network, Hopper 3 DVR, a Blu-ray DVD player and a Wii video gaming. The bedrooms boast handsome log furniture, comfortable memory foam mattresses and stylish bedding. The Master Bedroom offers a queen size bed, a half bath and a 42" flat screen TV. The second bedroom offers sturdy full over full bunks. To maximize the open areas in the bedrooms accessories are efficiently organized in closet bins in lieu of dressers to free up floor space. 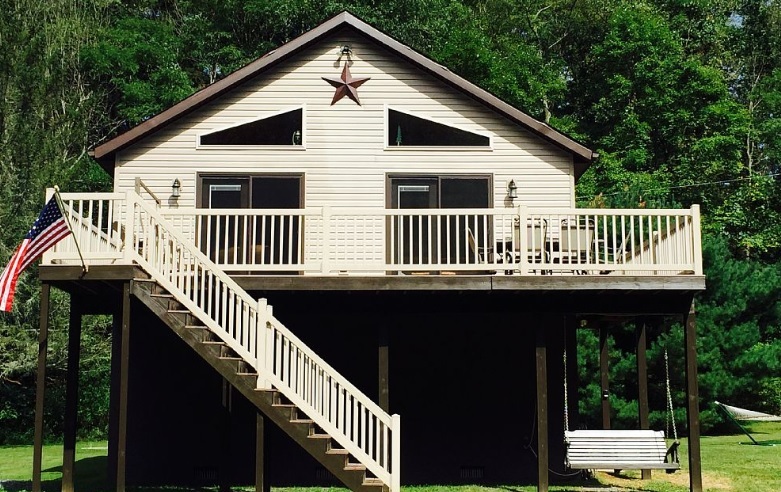 Outdoors you will enjoy relaxing river sounds and views from the expansive open deck. A spacious covered pavilion equipped with a sound system provides an additional venue to enjoy the outdoors. Kayaks and firewood are provided for your enjoyment. The property rests on approximately one acre of property in Everett, PA along the Raystown Branch of the Juniata River just a few hundred yards down from the Woy Bridge (Mile 69). The private gravel/dirt lane has no through access which favorably limits traffic to property owners, their guests. You will find a well maintained cottage on the left and a well maintained home on our right. To the back there are woods. To the front you'll find the river. You can typically expect an abundance of peace and quiet especially during the week. Activity generally increases on the weekend and when neighbors host their summer gatherings. A trip to Everett for groceries, golf or ice cream is a quick four mile trek. Downtown Bedford, a 13 mile drive, provides many dining options, antique shops, craft shops, historic sights and the prestigious Omni Bedford Springs Resort. 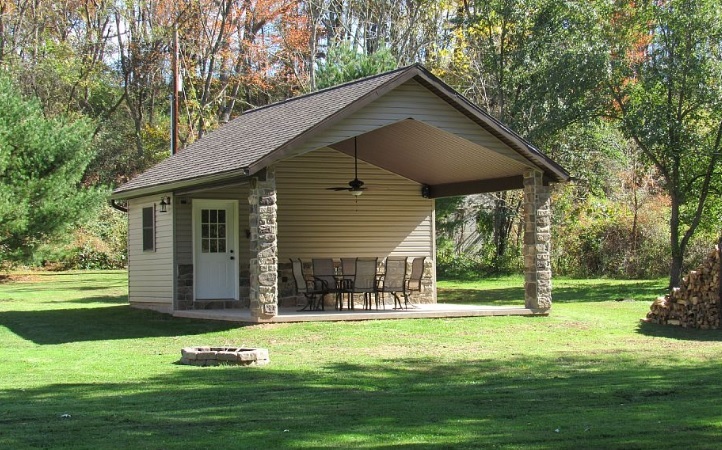 For easy travel access, Camp Shoop is only seven miles from the Breezewood Exit of the PA Turnpike (#161). What to do at the River…. • Kayak or Tube. When conditions are favorable you can enjoy a scenic float down the Juniata via kayak or tube. Five kayaks are provided. Note: A vehicle(s) of sufficient size or sufficiently equipped is necessary to transport kayaks to/from a drop point upstream or pickup point downstream. Please educate yourself about the river. • Riversit. Pull up a beach chair, sit and enjoy the sounds and the scenery. • Fish. Go for Bass, Rock Bass, Sunfish, Carp or Catfish. Conditions will determine what’s biting. • Bowfish for carp, suckers or catfish. • Relax. Read a book, do a jigsaw puzzle or make yourself comfortable on one of the wooden swings or the hammock. • Catch Night Crawlers. On a damp night, you’re likely to find plenty. They make great fishing bait and the catching process provides great entertainment particularly to those watching. • Build a Campfire, Roast a Marshmallow; Build a S’more. • Bird Watch. You’re likely to see Osprey, Herons, Hawks and possibly an Eagle. • Cook. Beyond the indoor cooking facilities, outdoor options for charcoal, gas and limited accessories for over the open fire are provided. Be creative and enjoy! A supplemental refrigerator in the pavilion is available to store your grill foods, overflow beverages, fishing bait, etc. • Watch TV. Dish TV with Hopper 3 is provided along with a limited movie library. If you’re looking for new releases, please bring them along. • Play Wii. We offer a limited Wii Video Game Library. What to do in the Area…..
• Dine Out. There are limited dining options in Everett (4 miles). Breezewood (7 miles) offers options typical of a highway interchange. Downtown Bedford (13 miles) offers non-chain unique options with inviting surroundings typical of a small historic town. • Go for Ice Cream. The Igloo in Everett is wonderful! (4 miles). • Golf. The Down River Course in Everett is enjoyable and affordable (4 miles). A more prestigious experience is available at Omni Bedford Springs Resort (15 miles). • Spa. Visit Omni Bedford Springs Resort (15 miles). • Antiquing/Craft Shopping. Downtown Bedford (13 miles). • History. Visit Fort Bedford Museum (13 miles) and/or Old Bedford Village in Bedford (17 miles). • State Parks. Shawnee State Park in Schellsburg (24 miles). Blue Knob All Seasons Resort in Claysburg (38 miles). • Flight 93 Memorial, Stoystown (36 miles). • Fish, Boat, Swim. Raystown Lake in Huntingdon (50 miles). • Lakemont Amusement Park, Altoona, PA. (48 miles). • DelGrosso Amusement Park, Tipton, PA. (60 miles). Summer means warmer weather, picnics and swimsuits. From Memorial Day to Labor Day you’ll encounter the most visitors at the river. The Autumn leaves are beautiful and a great time to attend the annual October Fall Foliage Festival in downtown Bedford. As the freeze risk increases, the seasonal dwellings close. Winter is desolate, yet delightful. Winter is a lovely time for a romantic getaway or a quiet family retreat over the holidays. A 4WD vehicle during the winter months is recommended as Pharr Road is a private lane which receives no routine winter maintenance. Camp Shoop is absolutely smoke free indoors and on the deck. Your pets may be considered. Note on Wi-Fi: dishNET Satellite High Speed Internet is the only internet option available for our rural location and comes with capacity limitations. dishNet Satellite is great for web browsing and email. It will not support video streaming services such as Netflix or Hulu. Additionally, it will not support online gaming via PlayStation or Xbox Live. To compensate for the video streaming restrictions associated with wifi limitations, the TV service package was upgraded to include the additional features of Hopper 3.